The nicely restored 1959 Harley Davidson FLH for sale is a 1200cc 1959 Harley FLH Duo-Glide Panhead motorcycle with a 4 speed floor shift (mousetrap), juice brake in the rear (first year), drum up front. Restored to original condition in 2002 by owner from a basket case, engine rebuilt by professional - 800 miles on the old Harley since the rebuild. and it has a newer Corbin single rider original style motorcycle seat, original SU Carb and the original fuel tank, original frame with matching numbers, original front end, etc. the transmission was rebuilt at same time as motor. This beauty has over 90% of its original parts PLUS I've invested more than $30,000 in restoring it over the years. FWIW, Jerry Lee Lewis' 1959 Harley FLH sold for nearly $400,000! I expect that you will as "Does it leak". Of course it does. . . it's an old Harley Davidson Panhead. . . LOL.. but nothing more than the primary doing what it's supposed to do. That I can scoot around on. I need the cash but need to ride just as badly -- LOL. I haven't ridden the bike in a while (maybe 3 months ago) as I am preparing for a hip replacement hence my desire for a motorcycle with an electric starter. I could go on and on listing accessories and features but you just must see to appreciate. I have many extra panhead parts that will go along with the bike including another transmission and side cover, primary chain, another genuine dash with the green neutral lens, manuals and parts catalogs and other stuff. My asking price has been drastically reduced as I can no longer ride. If you decide to low-ball me and I accept, I will keep the extras and blow them out here or on eBay (sorry). This fine, vintage Harley motorcycle was the Concours d'Elegance 2nd place winner in Ohio in 2005, other trophy's taken throughout the East Coast. Meticulously maintained and garaged at all times. Bear in mind that NOTHING will work here except cash, so don't waste your time telling me it's for your son in New Jersey and your shipper will pick it up. . . LOL. You may contact me for more pics or to view the bike and don't forget to mention that you found this ad on GoGoCycles Motorcycle Classifieds gogocycles.com..
SERIOUS INQUIRIES ONLY for this beautiful used motorcycles for sale!... Tired of scammers who send fake checks and say thier "mover" will pick up the bike... these guys crack me up. 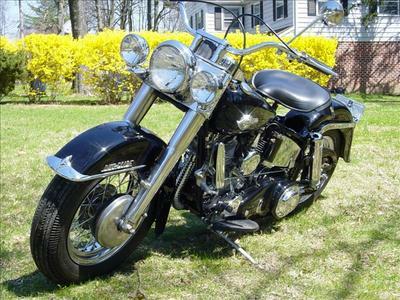 Why am I selling this beautifully Restored 1959 Harley Davidson FLH? Health problems and age .. would rather have a bike that starts with a button at this point. Is this a Duo Glide?